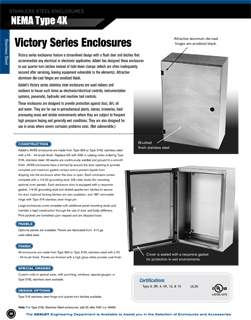 Victory Series enclosures feature a streamlined design with a flush door and latches that accommodate any electrical or electronic application. Adalet has designed these enclosures to use quarter-turn latches instead of hold-down clamps, which are often inadequately secured after servicing, leaving equipment vulnerable to the elements. 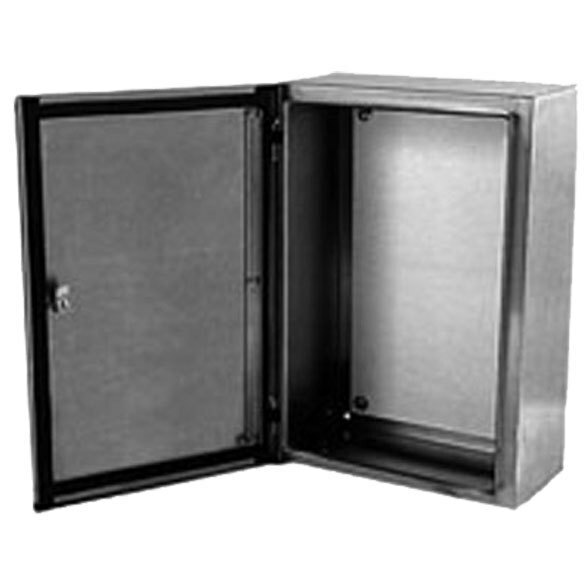 The Victory Series stainless steel electrical enclosures are used indoors and outdoors to house such items as electronic and electrical controls; instrumentation systems; and pneumatic, hydraulic and machine tool controls. Designed to provide protection against dust, dirt, oil and water, these custom stainless steel enclosures are used in petrochemical plants, dairies, breweries, food processing areas and similar environments where they are subject to frequent high pressure hosing and generally wet conditions. They are also designed for use in areas where severe corrosion problems exist.